Break the chillies into small pieces. Soak in vinegar chillies, peppercorns, cloves, cinnamon stick, sugar, tamarind paste, cumin seeds, ginger, garlic & salt for 20 mins. Grind in a blender/grinder to a fine, thick paste without using any water. Store in a clean sterilized bottle. Use as required. Marinate fresh prawns with 1 tbsp. masala paste for 10 mins. Heat cooking oil in a wok on med.heat. Add marinated prawns, 2 tbsps.masala paste & stir fry on high heat for 3 mins. To the same wok add onions & capsicum & stir fry for another 2 mins on high heat. To this add the prawns from the bowl & again stir fry & toss for another 3 mins. 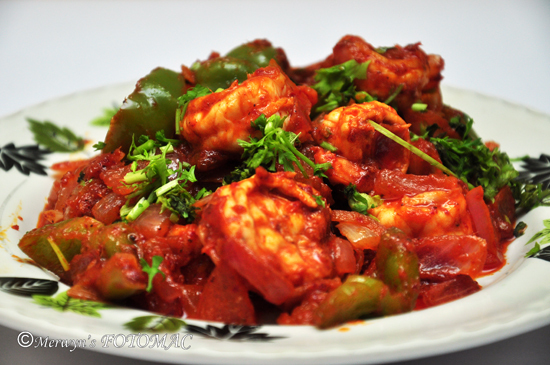 Serve hot with fresh bread, hot chapati or steamed rice. Hilda this is an awesome blog…my mouth is watering …i will definitely try out your recipes. 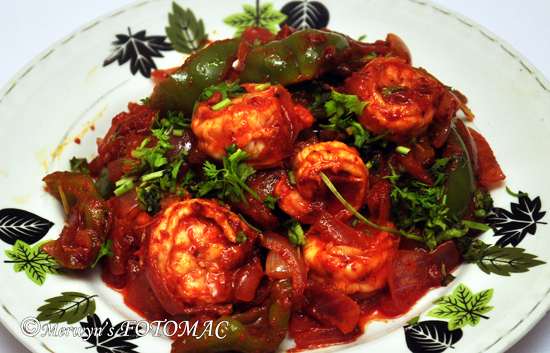 Can't help drooling,prawns looks so delicious..thanks for sharing Goan Rechao masala..
Hey Hilda, Lovely blog, stumbled on it while looking for something else, was impressed by the authentic recipes, will look forward to trying out your recipes. Will also remember to critique ;-D praise!!! Hi,Hilda..It's so Tempting I'am going to make it on this Sunday..Thnx for Sharing Lovely Recipes..Goan Paddy.PUNE.